Happy new year! I am thrilled because it’s only 2 weeks into the new year and we already had a good snowfall! Now, to y’all in the north, this is no biggie, but for me it’s like a shot of coveted winter wonder! So of course this week’s post had to be inspired by snow! This book is great! 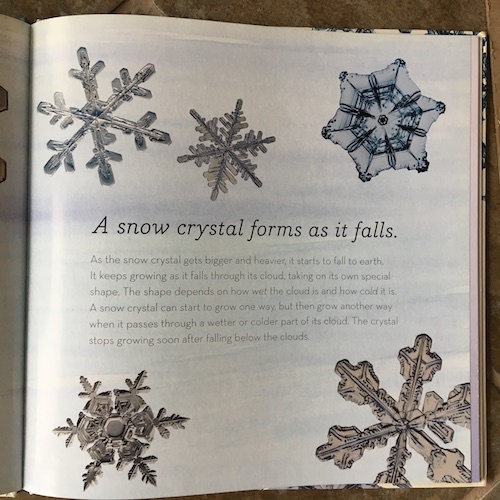 It’s full of actual magnified photographs of various types of snow crystals and flakes and explains how and why they grow in the various unique formations. Plus, it gives ideas for catching snowflakes to study yourself too. 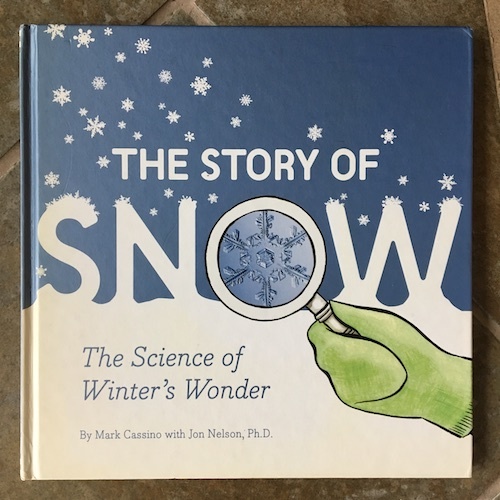 The Story of Snow is beautiful and informative, filled with both photos and illustrations, would make a great addition to any home library or classroom, and is a super resource for lower elementary snow research work. It is quite an inspiring book for all ages, I’d say. It even inspired me to make some snowflakes myself! 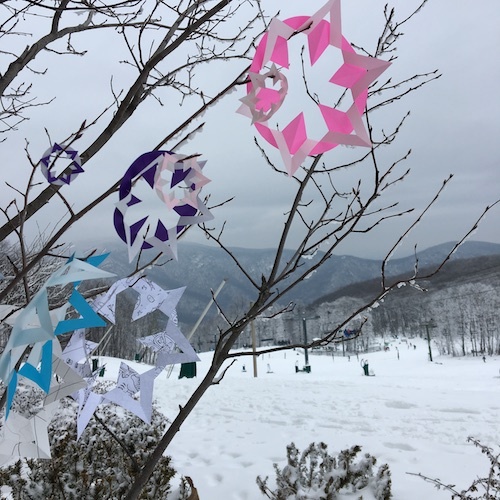 I modified the “Circle Stars” activity in the Community Playthings blog to create these 6 pointed paper snowflakes. I hope you have as much fun making them as I have been having. I’m hooked on making them in lots of different colors and sizes. 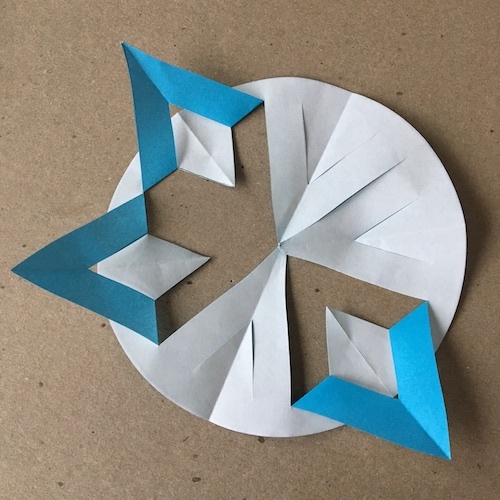 Make a Snowstorm of 6 Pointed Snowflakes! They are easy! All you need is paper circles and scissors. 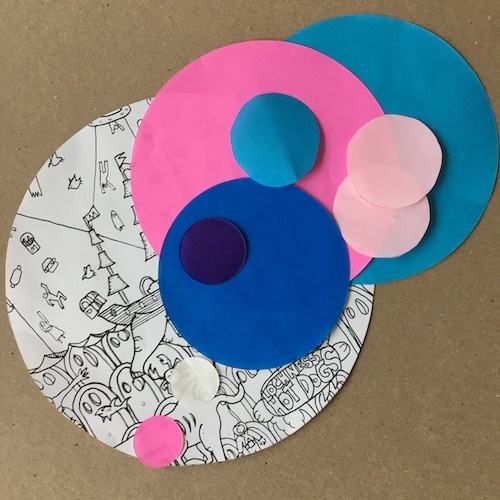 I even used some coloring book pages and used scratch pages out of a sketchbook and cut circles out of them. 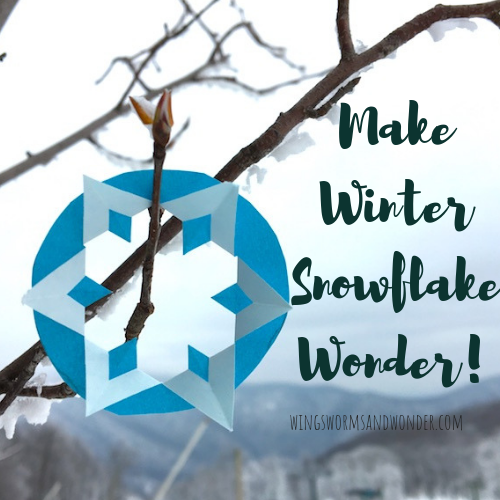 These snowflakes could be a fun way to up-cycle completed coloring books or even calendar pictures. 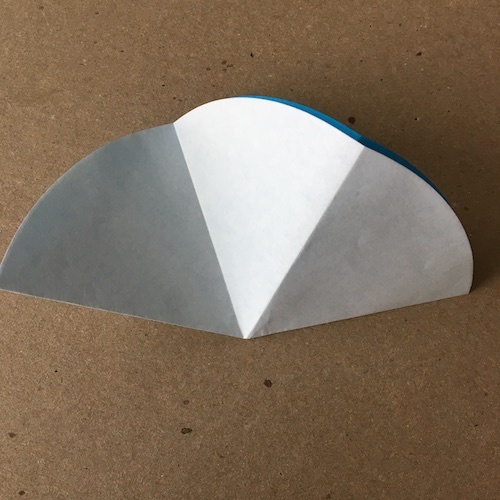 Take a paper circle and fold it in half. Then, fold it into thirds to make a pie shape. 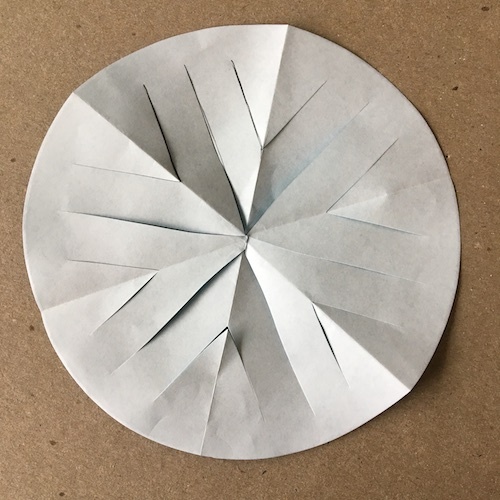 Folding the circle into thirds is the important part to making these snowflakes, as this is what gives them 6 points. Snowflakes specifically have 6 points, so that is key for them being snowflakes and not stars. Once you have your folded “pie”, cut a line up the middle from the point. You can draw the line first if you like. Be sure not to cut all the way through the piece. Leave a couple centimeters at the top. Next, cut 2 lines on either side approximately the same distance from the center and to the same height as the center line. Once the lines are cut, open up the circle. It doesn’t matter what side of your paper is facing up if your paper is the same color on both sides. If it’s not, the side that is up will show more. Play around with alternating front and back sides up and see what you like for different papers. 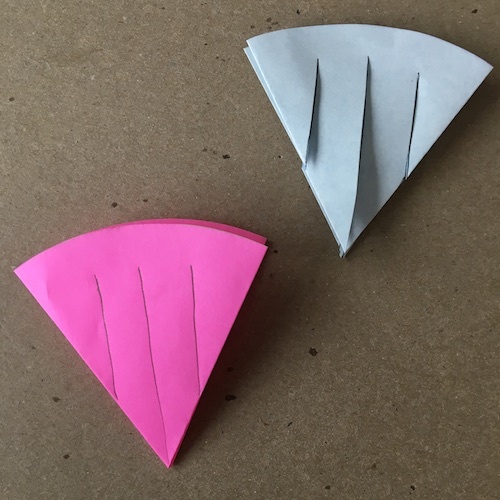 Once the circle is open, begin to fold up the triangles from the center point. You may need to separate the tips from the center if they didn’t cut all the way through. This happens to me pretty much every time. Do this to all 6 points. You can see above that having the white side up made my points blue and below that having the pink side up made my points white. Both ways look great, just different. I like to make snowflakes in different sizes of the same colors, alternating whether the points are colored or white. or even as stencils or collage material for nature art journaling! 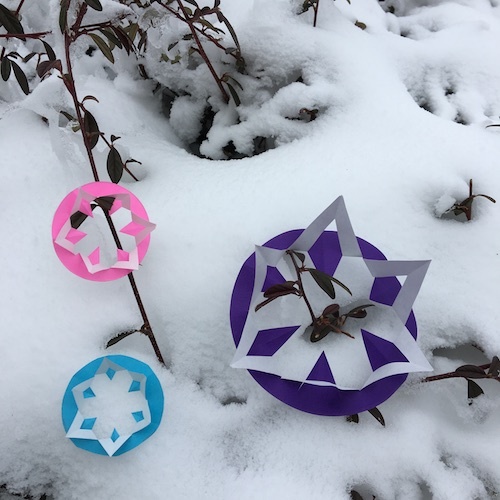 Try using translucent, tracing, and painted papers, or even clear gels, felt, or foam sheets to hang colorful snowflakes outside in your snowy white trees! How do you feel about snow? 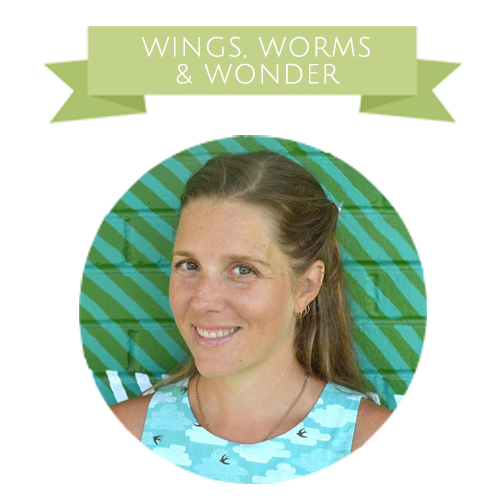 Is it worry or wonder inducing for you? Share pics of your snowflakes on Instagram #wingswormsandwonder and tag me so I can see! What is hygge anyway? It’s basically Danish for getting super cozy. Learn more and get ideas in this post! 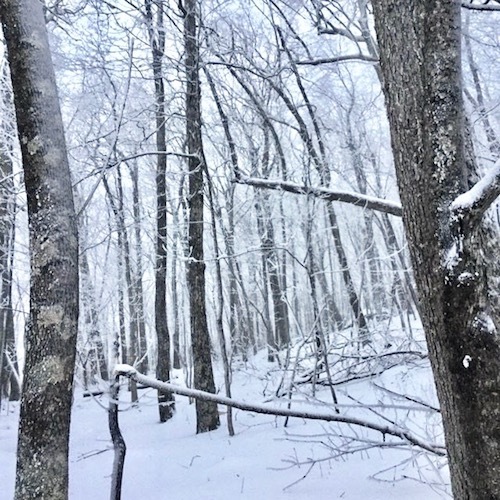 Winter Fun Everyday – Think like Norwegians! 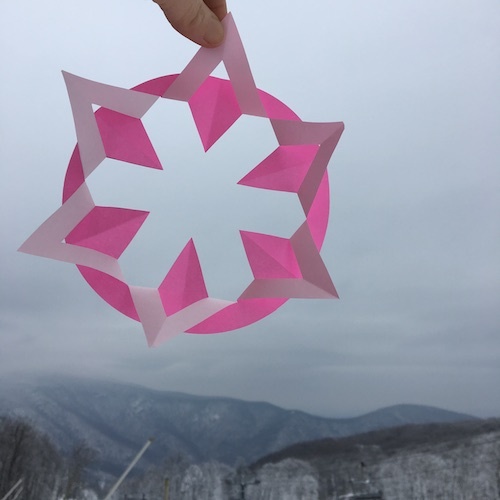 How can you use the Montessori fraction insets to make these snowflakes in your classroom? Trace the whole to make the circle, trace the half into the circle to fold in half, then fold on the line. 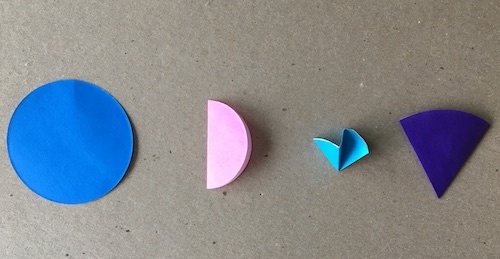 Then, trace the third piece 3x to make your 1/3 fold lines and fold on the lines! Here’s the Community Playthings Circle Stars activity that inspired my 6 pointed snowflakes. This is a great blog!